Production parameter memory incl. 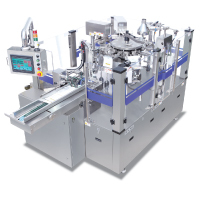 gripper size, machine speed, sealing temperature, filling volume. Ready to eat foods, solids in the sauce or vegetable meat mixes Rotary pouch machine integrated with cup conveyor, cup feeder, multi-head weighing unit.